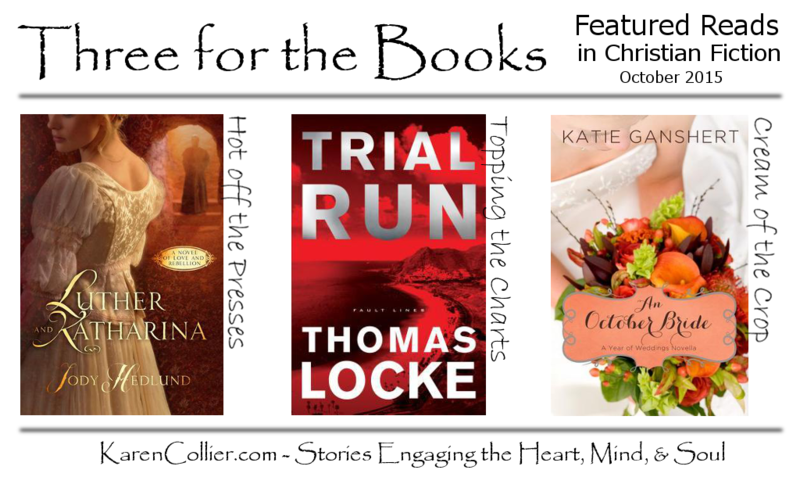 Trial Run by Thomas Locke appears on the CBA Best Sellers list for October in the Fantasy/Sci-Fi category. Published by Revell, it’s first in a new techno-thriller series called Fault Lines. The book trailer makes a great introduction to this title’s intriguing premise. An October Bride by Katie Ganshert won the 2015 Carol Award in the novella category. This short contemporary romance was first published by Zondervan in September 2014 (available in ebook and audio formats), and re-released as part of the Autumn Brides novella collection (available in paperback, ebook, and audio formats) in August 2015. I have Luther and Katharina in my TBR queue and am looking forward to reading it. I have heard so many positive things about it. But I am way behind in my reading schedule. Yikes! Feverishly trying to catch up. The other books looks great as well. Thanks for highlighting. I’d love to read all three of them. If I can just find the time! I look forward to hearing your thoughts on Luther and Katharina.